Wanna Go On A Cruise? This Ship Has A Literal Magic Carpet! Just when we thought cruise ships were completely decked out with all the latest entertainment offerings—think cinema rooms, outdoor pools, hot tubs, and, of course, super posh restaurants—we hear of a floating restaurant we never knew we wanted to visit. 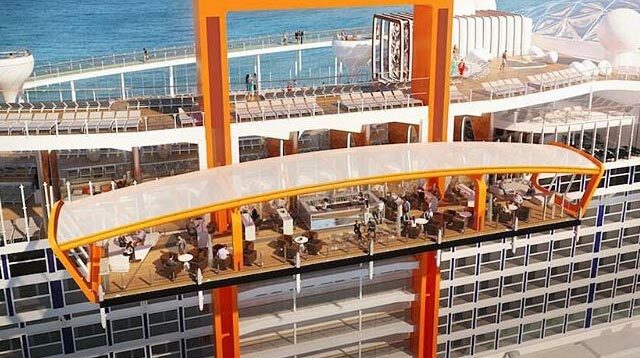 Celebrity Edge has unveiled plans for a new ship which, aside from being one of the most swanky things we've ever seen, has one feature that the Disney fan inside you will be dying to experience. The Magic Carpet restaurant, which is the size of a tennis court, floats between various decks on the new ship, creating entertainment spaces as it goes. According to The Daily Express, the Magic Carpet at the top deck (16) is a luxurious restaurant for 90 guests "offering a special 'Dinner on the Edge," while at deck 14, it "becomes an open air-extension of the main pool area." On deck five, the Magic Carpet extends to another restaurant to give it "the most amazing al fresco seating imaginable," and the lowest deck is the perfect viewing platform for guests. "Celebrity Edge is one of the most exciting, innovative, and transformational ships I have ever been involved with," Richard D. Fain, Royal Caribbean Cruises CEO told The Daily Express. "The new features and refined design will establish a new baseline for ships from here on out." The Caribbean cruise ship will first set sail from Florida next December (2018), but you can book your place right now.